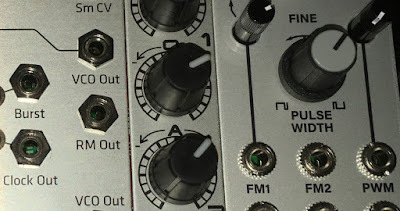 AllThingsModular: Another VCA in a pinch? Another VCA in a pinch? 1. Look for those hidden VCA's! You will often find hidden VCA's in modules that are called something else. For example, most ring modulators are the equivalent of VCA's that can respond to negative voltages. Feed 'em a standard positive-voltage envelope and you have yourself another VCA. Another good example (and the one I happened to use to get myself out of a pinch) is to check out a voltage-controlled crossfader. This kind of module is nothing more than a pair of VCA's, with one of them fed by an inverted control signal. All I had to do was use the 'A' side of the module (an Intellijel uFade) and feed an envelope into the control signal and I was golden. Another way to find a hidden VCA is to consider an unused filter. Lowpass or highpass filters often can extend their range to the point of completely cutting off the sound - and it kind of fades on the way out. The result is that you can use voltage-controlled modulation to alter the overall level of the sound - producing the rough result of a VCA. I actually often do this on purpose; it's a very different sound than a typical VCA (and is maybe more akin to what a lowpass gate tries to accomplish). It's pretty effective with a 4-pole filter and a fat sawtooth wave, with the fade-in taking on the character of a big, round blob. Ultra-effective during a live show, and a bit more dramatic than a volume mod. 3. Zip up that rect! Yet another sonically-rich way of volume control comes from voltage-controlling the width of a pulse wave oscillator. Most pulse waves can be turned all the way to 0% or 100% - both of which turn the oscillator into a static voltage offset, but not making any audible sound. The voltage control of this function is even more dramatic than the filter change, since you get a growl-to-wheeze movement that is quite unexpected. This one won't suit every taste, but sometimes it's an effective way of getting a unique sound - and voltage-controlled amplitude as well! Of course, you can always act as a VCA as well. Volume knobs abound in a modular system; don't be scared to grab one and become the best VCA in your rig! Too often, modular-heads want to build a system then sit back with a gin-and-tonic and enjoy the show. But creating dynamics by twisting that level control can actually accomplish something that will never happen with an automated system - it'll respond to your emotions. Don't downplay the value of this, implying emotion in electronic music is tough enough already, don't disallow the value of some hands-on wiggling. There are a bunch of other ways I can imagine this working: using logic modules with the right modulation combo, interactively mixing in an inverted version of a waveform, or extreme application of hard sync, but I'm not in a position to try these out at the moment. But hopefully I've given you some ideas about new ways to approach volume management without necessarily falling to the easiest answer - and maybe this will free up some VCA action for you to do more weird-o modulation as well!